By terminating one port, a circulator becomes an isolator, which has the property that energy flows on one direction only. This is an extremely useful device for "isolating" components in a chain, so that bad VSWRs don't contribute to gain ripple, or lead to instabilities (unwanted oscillations). An isolator is a non-reciprocal, passive network. 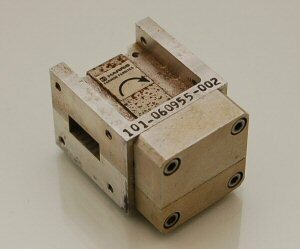 Here's a WR42 (Ka-band) waveguide isolator we spotted recently on Ebay for forty bucks. This one is clockwise orientation (at least until you flip it over!) The waveguide is made in the way that is most sensitive to weld integrity. The load is probably rated at 1 watt or less (it is pretty small). Click for a close-up view! If you want to learn where the name "Farinon" came from (it appears on the isolator photo above), visit our "where are they now" page!